Hair from a dead bigfoot? While trolling ebay I ran across this photo, so I stopped and read the description. 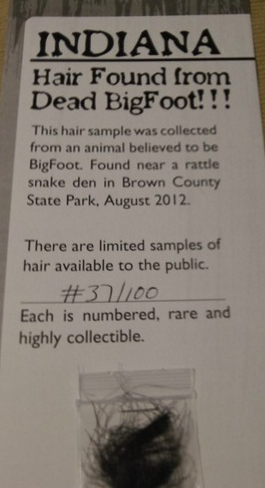 Apparently this bigfoot hair sample came from a bigfoot that was bitten by a rattle snake and died. this beast already dead from a nasty snake bite to the leg.This male is 8.5 size 17foot..We have been back now several times and have hair,nails,teeth samples and pic's and of corse video that will be released later on after I make sure no-one finds this den.I don't want it disturbed or destroyed like every other animal on the planet!!!" The ebay seller id is "comeandgetit1234" and they have about 50 feedback, almost all good. So according to this ebay seller they have photos, video of the dead bigfoot, plus hair, nails and teeth samples. I personally like the novelty of the "bigfoot hair" sample auction but I have serious doubts that any of the story is true. I also notice that there are several "bigfoot hair" auctions on ebay. Might be cool to have one just for the novelty factor. If anyone has any info feel free to share it. I just wanted to share this and see what others think as it seem most like the "dead bigfoot" stories. WOULD A SNAKE BITE KILL A LARGE BIGFOOT?MY GUESS IS NO. Yeah I doubt a snake bite would kill just a large creature. This is indeed cool and interesting. Does Bigfoot really exist? Many believe that this is just a creation of the mind but many also think this is really true. Whatever the truth is, I still find this very much interesting. Bigfoot really amazes me. Thanks!